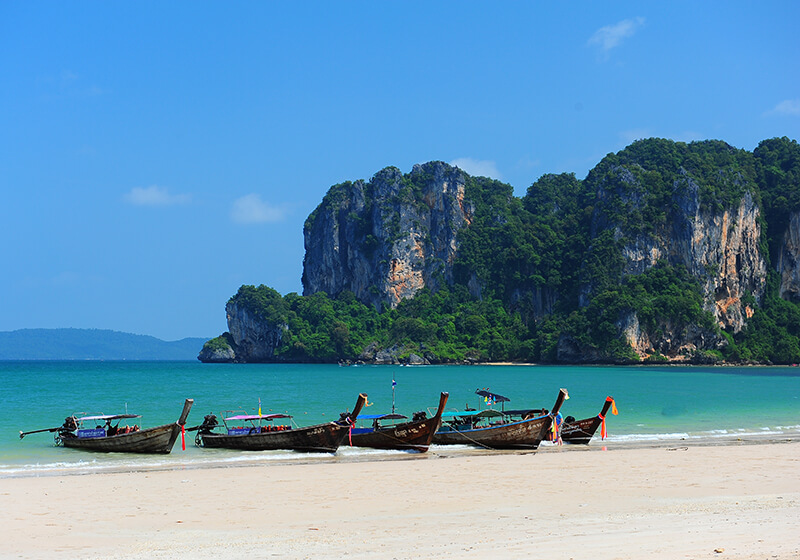 Ao Nang is the most “Westernized” beach in Krabi, originally a backpacker hotspot but now moving slowly upmarket as the airport brings in higher flyers. While not quite as scenic as Railay, there is a good range of cheap accommodation, many good restaurants, easy transport and travel/tour agencies ready to cater to your every whim, making it a good base for exploring Krabi. Orienting yourself in Ao Nang is easy : almost everything is located either along the beach, which runs west-east, or along the Airport Road (Hwy 4203) which goes up north from the east end of the beach. Long-tail boats arrive on the beach near the junction of the two roads; these long-tails, though, create a problem: the level of noise pollution arising from an endless stream of undampened boat motors during high season is substantial.